IITL Nimbus “The Golden Palms” has very unique location. This affordable group housing has been developed in sector - 168 Noida. Though “The Golden Palms” is situated on highway and it has corner plot, therefore The Golden Palms can be visible from long distance and it is very easy to address someone. Moreover many Multinational companies are operational in this location where “The Golden Palms” exist. MetLife, Accenture, TATA consultancy services,Steria, Genpact, Info space and many more IT & ITES companies are functional in same vicinity, even schools and hospitals are very near by from the residential project. It is only 7 km (Appox) from sector-18 (Atta market) Noida. 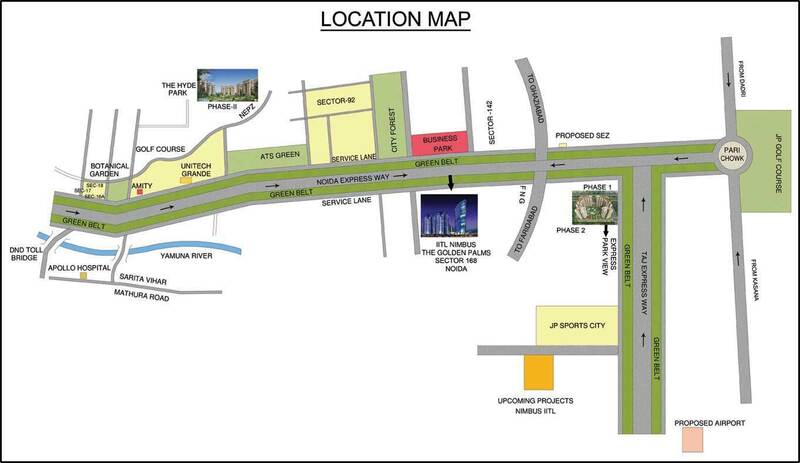 Proposed metro station and IT & ITES “SEZ” in immediate neighbourhood. 25 minutes drive for Connaught place “Delhi”. FNG corridor is situated just next to the project. Indira Gandhi International Airport is only 50 minutes drive & Safdarjung Airport - 25 minutes. New Delhi railway station is only 40 minutes drive, Dadri Railway Station - 30 minutes drive & Anand Vihar Terminal - 25 minutes drive.